Dental fluorosis is a common teeth condition in young children that has become more prevalent in the recent years. Read and know all about the causes, symptoms and treatment of this disorder. 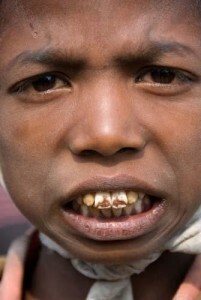 6 What Level of Fluoride Causes Dental Fluorosis? Dental fluorosis is a condition characterized by noticeable white spots on the tooth enamel that later on develop into severe pits and stains. It is typical among children who consume too much fluoride, either directly or indirectly, while brushing or drinking water. 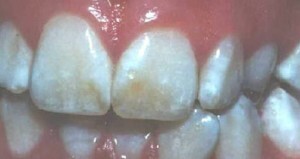 Although it is mainly regarded as a children’s condition, Dental fluorosis has also been reported in adults. Children age 8 years and younger are the common victims of dental flourosis. This normally happens while their permanent teeth are beginning to develop under their gums. However, this no longer remains a problem once permanent teeth erupt through the gums and get exposed. This is because the immunity level of the mouth also increases along with the sprouting of teeth. Presently, studies about Dental fluorosis in adults are being conducted. Although most adults are said to be non-susceptible to this dental condition, a few complain of having similar conditions and discomforts. These are serious symptoms that should not be disregarded by patients or their family members. If your child begins to exhibit one or more of the aforementioned signs, do not wait for more serious symptoms such as larger white spots or rough pitted teeth surfaces. Seek the advice of your dentist and inquire about the most effective treatment strategy for your child. Although fluoride is believed to be necessary for the growth of bones and teeth, it is regarded as the primary cause of this disorder. If consumed in excessive amount, this salt can be highly damaging for the body. This is especially true for children who do not have a strong enough immune system to combat effects of high amounts of fluoride on the body. Therefore, it is necessary for parents and guardians to be aware of the appropriate amount of fluoride that can be used by children. Fluoride is a non-biodegradable element and cannot be digested. Dental fluorosis arises as a natural response of the body whenever the salt enters into your system. Fluoride is beneficial only when it is taken in proper amount. In recent years, it has been revealed that fluoride in large dosages causes tooth and bone decay. There are dangers in using excessive amounts of this salt and the dental community is doing its best to make a campaign for everyone to be aware of this matter. The following are the major sources of fluoride intake among children and adults who suffer from Dental fluorosis. It is best to refrain from using these products and reading the labels of items you buy. If you find any of these products containing fluoride, it is better for you not to purchase it, especially if it is going to be used by your children. Be mindful of these fluoride limitations and remember to purchase water that does not contain fluorine if possible. It may cost you more, but it is the best way not to suffer from fluorine complications, including dental fluorosis in adults and children. What Level of Fluoride Causes Dental Fluorosis? Those who use fluoride tablets in hope that it will add to the cleanliness of the water they drink are not recommended to do so if the fluoride concentration of their water is already 0.7 mg/L or higher. To be sure, you can inquire with your public water system for information. However, as a tip it is important to note that water and processed beverages sold in the US are most likely to cover the maximum amount of fluorine tolerated by the body. Limit your use of fluorine by purchasing products that do not contain this in their ingredients. It may be quite uncomfortable at the beginning, but you will soon get accustom to it and it will bring a healthy body for your entire family. It involves rubbing off the outer layer of the enamel with sandpaper. This is commonly done for mild cases of the disorder. It is never performed in severe cases due to the possibility of exposing more porous layer of the enamel. It is perfect for curing the condition in adults. It requires roughening the area where the damaged enamel lie and creating a composite resin that matches the hue of the enamel to produce a natural color. This is glued to the exterior tooth for a more beautiful smile. 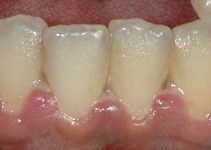 Quite similar to Composite Bonding, this curative option utilizes a ceramic shell over the surface of the damaged tooth. Although more expensive than composite bonding, it allows patients to chew food with greater ease and confidence. Here are some pictures of teeth affected by Dental fluorosis that will help you compare with those of your child, if you suspect he/she is having the condition. Take a look at these images to find out whether this disease is the reason behind the unpleasant appearance of the teeth of your kid. Never allow your children to use mouth rinse with fluoride. Reserve it with individuals who have higher risk of suffering from tooth decay, but never for yourself and your family. If you insist in using one then you should ask your physician or dentist with the best mouth rinse to use. 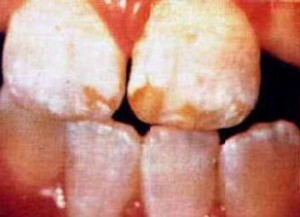 As already said, intake of too much fluorine is the main of Dental fluorosis. Look for drinking water with the lowest fluorine content, particularly if you have children in your family. Buy a toothpaste brand that does not contain fluoride, to minimize risk of getting this disorder. Remind your kids to gargle their mouth with water to avoid fluorine residues to be absorbed by the body. If you need to provide fluoride supplements to individuals, prescribe lozenges or chewable tables to further maximize the topical effects of fluoride into the system. It should be consistent with the prescribed schedule of the American Dental Association Council on Scientific Affairs. When purchasing bottled waters and placing it in your refrigerator, label it accordingly so you can easily identify the beverage that is tolerable to your kids. Be well informed and acquire more information about Dental fluorosis from the internet. Consider all of these recommendations and be mindful of the dental hygiene of your children. Any sign of abnormality on the surface of the teeth has to be addressed at the earliest by your dentist or physician. The doctor I cuerrntly work for doesn’t endorse fluoride. He tells me it’s because it’s toxic. However, that’s all he says about it. I’ve only worked for him for 4 months. We do give out Act samples to kids and do fluoride treatments after child prophys. Seems hypocrital to me. I endorse fluoride because of the benefits it provides in preventing cavities. I also strongly endorse fluoride because of the reduction in tooth sensitivities in adults. We use cavity varnish on sensitive exposed root areas. I will give myself a fluoride treatment after I’ve finished using bleach treatment to whiten my teeth. It reduces cold sensitivity almost to nothing. Love fluoride.